The Battlefield is a large cavern accessible through the West Sewers. 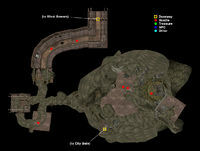 Battlefield caverns was the site of the destruction of Old Mournhold by Mehrunes Dagon. 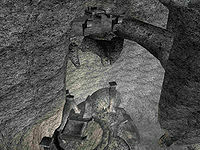 The Battlefield itself is accessed through West Sewers underground, and has access to the Abandoned Passageway (you will need Levitate to reach the door) and Old Mournhold's City Gate to the southeast. Battlefield is guarded by six goblins of various ranks. The only treasure is a steel helm and a shockbite battle axe by a corpse to the southwest. This page was last modified on 14 December 2017, at 12:00.